Our new Fiber Optic Snoot Set for the Inon Z & D model strobes and Sea & Sea YS-D1 & YS-D2 range of strobes, brings a whole new dimension to underwater macro photography. 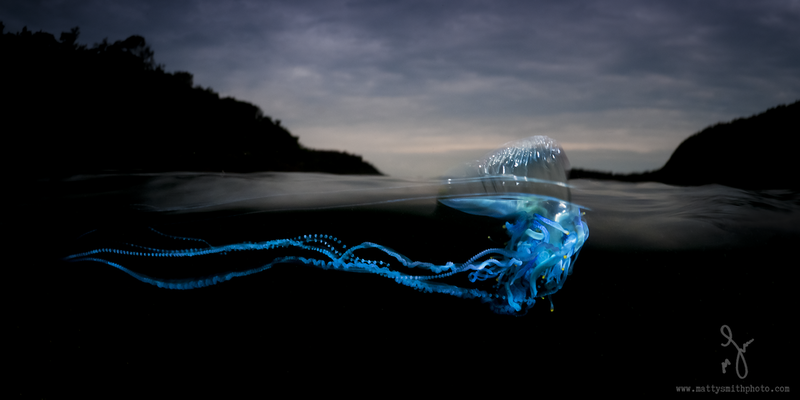 Reduce Backscatter to be almost non-existent, create perfect Black Backgrounds in your macro shots without post editing. Take control of your macro lighting like never before. The light from your strobe is directed down the multiple Fiber Optic Cables, inside the small flexible arms. The light exits in a straight line from the end of the arms and is directed at your subject, as two small circles of light. There is no light in the background of your photos, so no particles are lit by your strobes, the background is perfectly black. 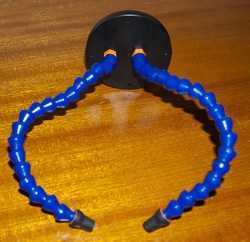 Currently we have two models of BluSnoot Fibre Optic Snoot Sets. One model fits onto the front of the standard Inon Z and D series strobes (Inon Z240, Z220, Z220S, D2000, D180, D180S ). 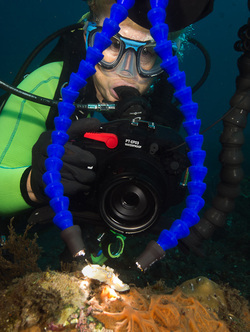 The other model fits the Sea & Sea YS-D1 & YS-D2 strobes. No modification is necessary to fit the BluSnoot, as the front cap fits with two stainless steel (316 grade) screws. This makes for a strong mount with no movement. The two flexible ball arms that contain the mult-core fiber optic cables, are attached directly into the front cap and tightened by hand. That's it, nothing complicated, an easy fast assembly and only one strobe is needed, as two arms are supplied with each BlueSnoot Fiber Optic Snoot Set, you can get even lighting in your macro underwater photography using only strobe. No more harsh shadows or one-sided lighting. See some samples on this page or visit our Flickriver site (below) for our latest photos. 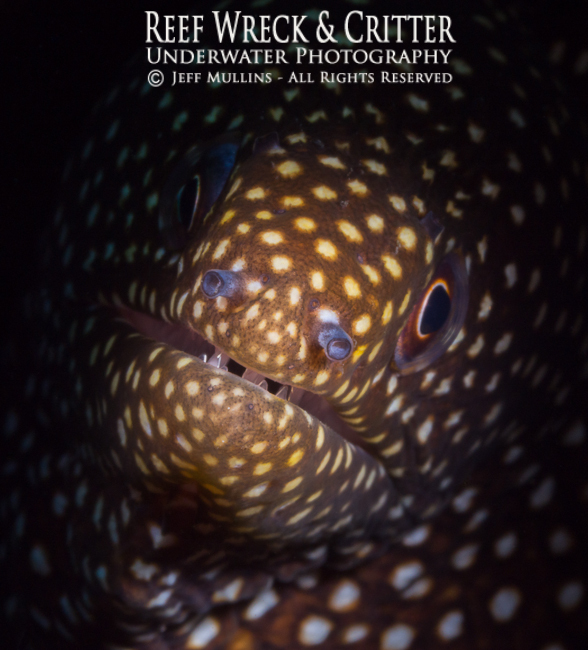 What They Cost: Please visit our Underwater Photo Accessories page for the latest pricing dependant on the model of your strobe. Contact us to order or ask a question. The BluSnoot Fiber Optic Snoot fits all of the larger Inon Strobes, including models Z240, Z220, Z220S, D2000, D2000S, D180, D180S. We also NOW have a model for the very popular Sea & Sea YS-D1 & YS-D2 strobes. 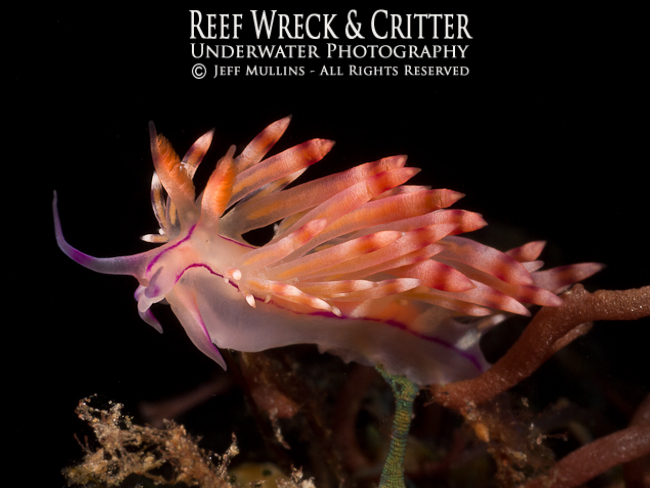 Flabellina Nudibranch - Photo taken using a BluSnoot Fiber Optic Snoot Set on an Inon Z220 strobe with an Olympus E-PL2 camera and Leica 45mm macro lens. Why we use multi-core rather than single-core fiber optic cables in our BluSnoot Fiber Optic Snoots. What do our customers say about BluSnoots? "The BluSnoot is so versatile I don't know how I ever got by without it before, the creative possibilities are endless really. I had had so much trouble lighting these subjects exactly how I wanted them to look previously". 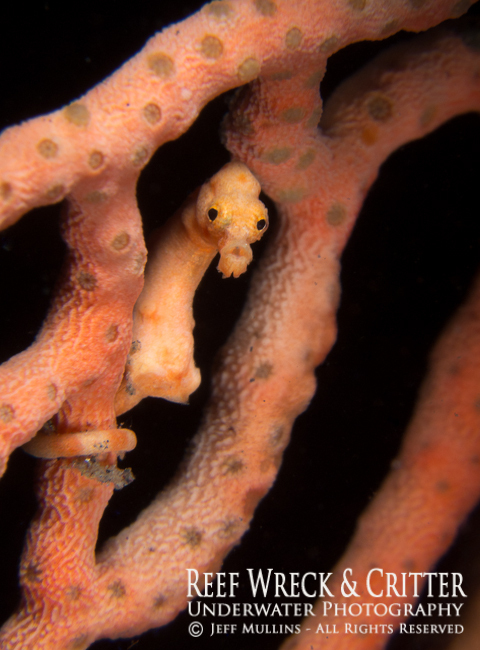 In this photo of a pygmy seahorse, the fibre optic snoots were aimed with one arm from above the seahorse and the other below. 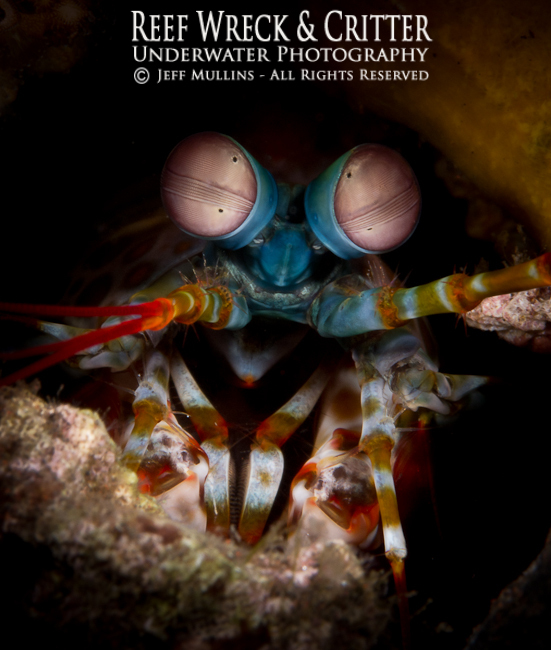 This photo of a Mantis Shrimp was taken with the Fiber Optic Arms pointing almost down the hole the mantis shrimp was hiding in. The shrimp was inquisitive about the arms of the BluSnoot so kept running out to look at them! In this photo of a nudibranch, the fiber optic snoots were aimed at either side of the nubibranch, to illuminate only the subject. All of the background is then completely black. 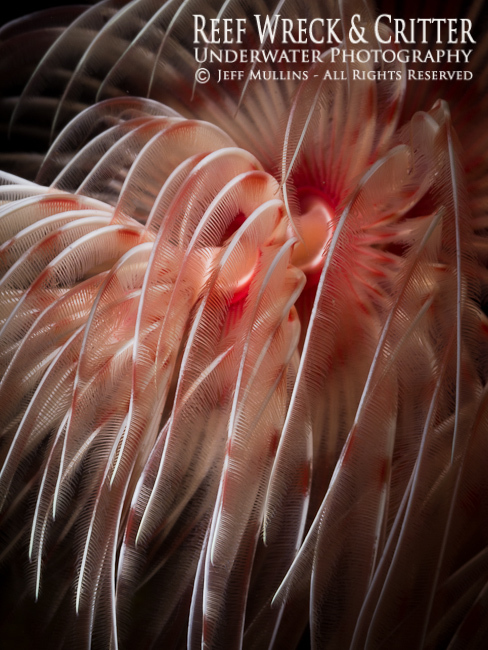 This photo of a Tube Worm was lit from the extreme top & left side of the photo, high-lighting the detail in the arms. 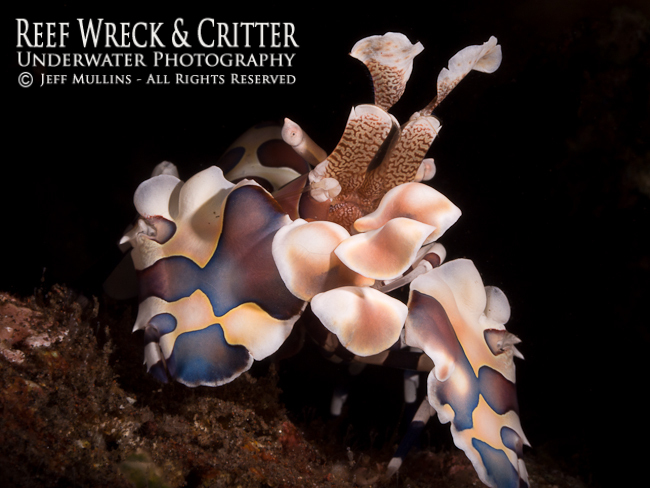 This Harlequin Shrimp photo was taken with the ends of the fiber optic arms pointing directly at the shrimp from just outside of the photo frame. 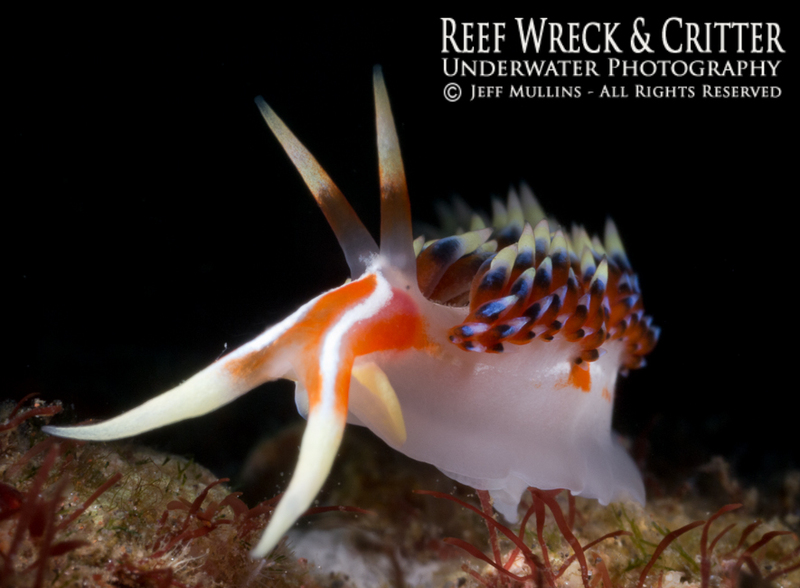 This nudibranch photo was taken with both fiber optic arm angled downwards at a 45 degree angle from either side. This photo of a white mouthed moray was taken with one fiber optic arm on each side of the eel's face. 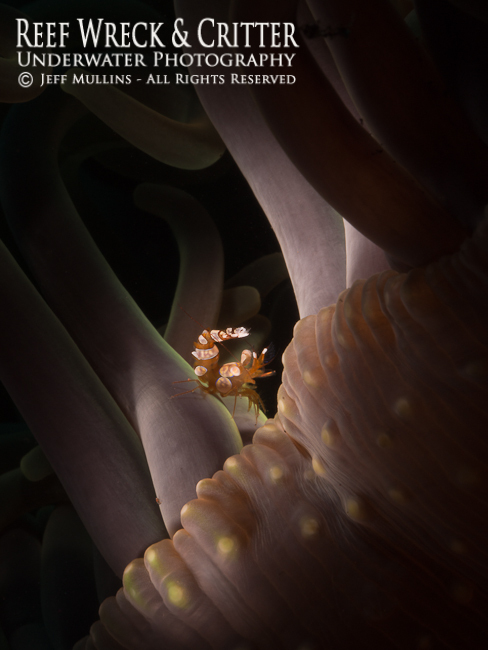 This tiny shrimp was photographed with the two fiber optic arms side by side and aimed from directly above the shrimp.